President Donald Trump welcomed FIFA boss Gianni Infantino to the White House on Tuesday, congratulating football’s governing body for awarding the 2026 World Cup to North America before jokingly waving a red card at journalists. “I very much appreciate the fact that we have won a very important event, the World Cup in 2026,” said Trump, who had backed the joint USA-Mexico-Canada bid which triumphed over Morocco at a vote in Moscow on June. “Soccer is a game, I guess you call it football,” Trump added. Trump meanwhile noted that he would be out of office by the time the 48-team tournament arrived in North America. Infantino meanwhile said FIFA was confident of helping produce a “fantastic” tournament in 2026, before presenting Trump with two soccer jerseys — one bearing his name and the number 26 (referring to 2026) and other with the number 45, denoting Trump’s status as the 45th US President. 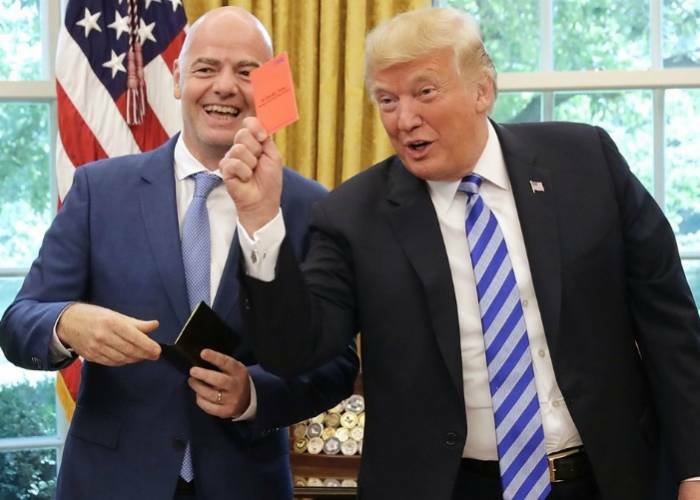 Infantino then handed Trump a pair of referee’s yellow and red cards, before explaining their meaning. Trump duly seized the red card and directed it at members of the press. “So this will be useful, I don’t know, that’s for your next media session,” Infantino joked.